1. Rapid rolling shutter applies to external and internal door of workplace, such as food, medicine, electronic, automobile, logistics and machine. This kind of possessess good wind resistance and heat insulation; 2. Rapid rolling shutter is stable, high speed, energy saving, eco-environment, sand resistance, insect resistance, easy change and clean; 3. In order to meet the demand of customer, the door can be opened by hand control, radar control, geomagnetic control, stretching wire switch, remote control and remote central control. 4. Common wind pressure: 2-3 class. Daily operation time can be up to 1000 times. 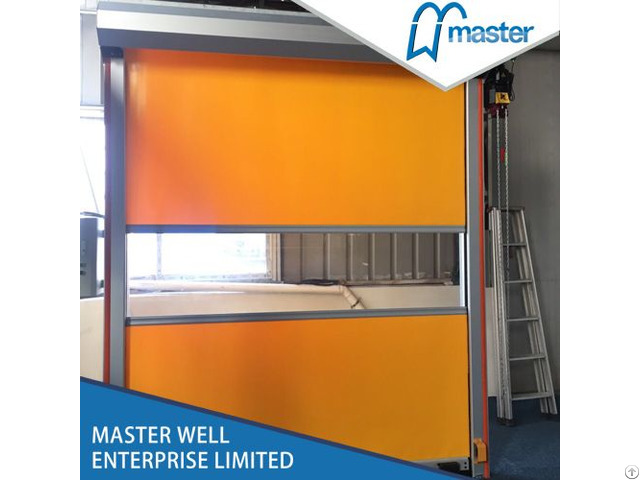 Business Description: Master Well Enterprise Limited is established in 2009, located in Wuxi city, Jiangsu province. Our company is specialized in thermal insulation & energy saving doors and windows, including sectional garage door, industrial sectional door, roller shutter door & window, PVC high speed door, aluminum fast rolling door as well as hardware and motor for these doors. With about 10 years of experience, we commit to be the premier supplier in the field of doors & windows. Our garage door, garage door motor, roller shutter have been approved by CE successively. Our products have been exported to Asia pacific, European, American, Australia regions, covering all over the world. Relying on our excellent business performance, we are growing up to over 100 people team, with different departments especially for international sale, research & development, after-sale service etc., we are always ready to provide the professional service to you. ?